May 1, 2008 was celebrated as the "World Labor Day" and the "Gujarat Day" with prayers, meditation, and service to the poor & needy. was devoted to Darshan & Satsanga with H. H Revered Gurudev Sri Swami Chidanandaji Maharaj through DVD television programs. The Evening Satsanga was filled with the holy name of the Lord during Sri Rama Katha by Sri Ajay YagnikJi. ( of Delhi). 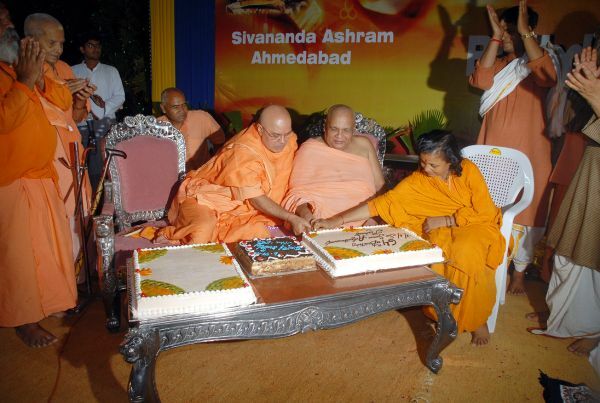 With great devotion and enthusiasm devotees at Sivananda Ashram, Ahmedabad, celebrated 64th the birthday of their Beloved Sri Swami Adhyatmanandaji Maharaj. As always, it was celebrated in a spiritual way with more Japa, Meditation and in the presence Holy Saints on May 3, 2007. The day began with group prayers in Brahmamuhurta which followed a special felicitation program by morning yoga attendees. Sri Swamiji Maharaj distributed prasad to all students. After paying homage at the Shrine of Sri Gurudev at Chidananda Dhyan Mandir, Sri Sri Ashta Laxmi Bhawan, Sri Rama- Hanuman Temple, & Sri Vishwanath Temple, Sri Swamiji Maharaj joined the devotees in "Aayushya Homam" which continued till mid-day. A blood donation camp was organized in coordination with the Gujarat Red Cross organization. Seventy two donors donated blood. At mid-day a delicious lunch was served to hundreds of the Daridranarayana in their colony. Also 20,000 notebooks were distributed to the tribal students and children in underprivileged area of the town. At the ashram hundreds of devotees attended maha-prasad (bhandara). There after, devotees joined the chorus Maha Mrityunjaya Mantra Japa chanting, which continued till the late afternoon. This was followed by Vedic Satsanga & darshana of H. H Sadgurudev Sri Swami Sivanandaji Maharaj trough video. The annual general meeting of Gujarat Divya Jivan Sangh trustees was held in the afternoon. The evening satsang commenced with devotional music by Dr. Monica Shah (Surmani). It was graced by the presence of Acharya Mahamandleshwar Srimat Swami Vishwadevanandji Maharaj (of Sanyas Ashram, Ahmedabad), Mahamandleshwar Sri Swami Mangalanandji Maharaj ( President, All India Sadhu Samaj & Gita Mandir, Haridwar/ Ahmedabad), H. H Sri Swami Gurusewanandji Maharaj (of the Divine Life Society, Orissa), Sri Jasbhai Saheb from Anupam Mission, Mogeri), Brahmachari Divya Chaitanya Mataji ( President, Sivananda Ashram, Kendra Pada, Orissa), Brahmakumaris Usha Didi & Chandrika Didi , Giani Ratansinghji (of Gurudwara Gobinda Dham, Sarkhej-Gandhinagar). Sri Swami Nischalanandji Maharaj (Sivananda Ashram – Hanuman Mandir, Khadala) and a few other saints of the Sivananda Family. Devotees were fortunate to receive Blessings of Mahatamas. H. E Governor of Gujarat was unable to attend this function. He sent his birthday wishes & greetings with shawl, garland & apology note. People expressed their love, reverence and gratitude to Pujya Sri Swami Adhyatmanandaji Maharaj in so many different ways & in different words for his praiseworthy work initially at the DLS HQ, Rishikesh and now for creating Sivananda Ashram, Ahmedabad a blossoming spiritual center that provides the field to spiritual aspirant to evolve in their spiritual journey Forward, Onward & Godward. The mammoth gathering had gala time with food and devotional music by Sri Ajay Yagnikji at evening function. Also, the function was highlighted with the release of books "Shiv-Ananda", the Gujarati translations of 'Bliss Divine', 'Japa Yoga', 'Thought Power' of H H Sri Swami Sivanandaji Maharaj and 'Forever Here' of H H Sri Swami Chidanandaji Maharaj. The evening function continued in festive mood that culminated in guided meditation by Sri Swami Adhyatmanandaji Maharaj at midnight. Devotees in their overwhelming devotion performed Aarati and cut the cake. The Mangoes, cake pieces & a calendar were distributed as Prasad to all. Thus the whole day's celebrations concluded very late at night. 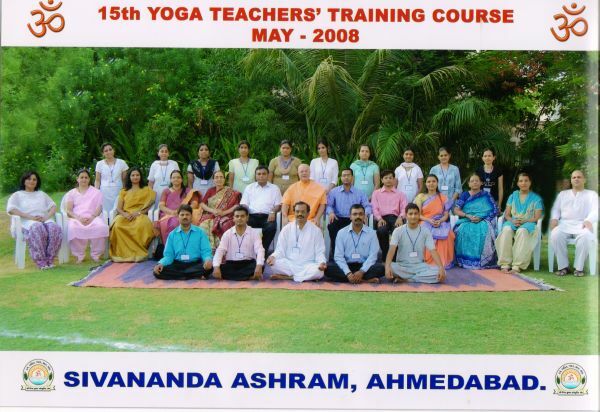 A residential camp for children was organized at the Sivananda Ashram, Ahmedabad from May 5, 2008 - May 9, 2008 . Each day commenced with early morning Prayers, Meditation, Yogasans, Pranayams, & chanting of Vedic hymns. The forenoon session commenced with moral-ethical teachings by Sri Swami Adhyatmanandaji Maharaj, classical music lessons by Dr Monica Shah & her group, painting, craft & art lessons by Miss Ridhi Manna of the Times of India, Ahmedabad. The afternoon classes comprising storytelling & Reiki lessons conducted by the Reiki Grandmaster, Mrs Roopa Majumdar. In the evening Sri Swamiji led the children to the playground. This was followed by the evening meditation & after-dinner satsang. On the evening of May 9, 2008, a grand valedictory function was held, which was attended by the parents. All the children were bubbling up with joy. They presented a small show, classical music & demonstrated yogasans, which they had learnt during the preceding five days. Certificates were awarded to the participants by Smt Rannaben, daughter of freedom fighter & well known Gandhian Sri Prabhudas Patwari. All the children received token prizes also. The famous two-wheeler company Yo Bike awarded for the best painting. "East and West are filled with hundreds of yoga teaching shops, but Sivanada Ashram's teaching is systematic, scientific, filled with Vedic and Upanishadic knowledge and at the same time it is very economical. The course design is unique. Discipline during education, punctuality of all teachers and sincerity are remarkable. Food served is also excellent. Even in our homes we don't get such delicious food." - These feelings were expressed by the Yoga students who attended 15th YTTC organized at Sivannada Ashram, Ahmedabad. Seventeen advanced Yoga students attended and successfully completed YTTC, which was held through "SIVA Yoga Center" at Sivananda Ashram, Ahmedabad, under the guidance and leadership of Sri Swami Adhyatmanandji. Among the students, one came from Thailand , two from USA, one from Haridwar and the rest were from all over Gujarat. Our team of Yoga Teachers including Sri Swami Adhyatmanandaji Maharaj, Dr. Varsha Dave (Gynecologist), Dr. Bharat Trivedi (Dean, VS Medical College), Dr. Amish Kshatriya (Orthopedic Surgeon), Dr. Vishal (Diabetologist), Dr. Ira Patel (Pathologist), Mrs Chiidrupini Kshatriya (Dietician), Smt Roopa Majumdar (Reiki Master), Ms. Sangeeta Thawani (Yoga teacher) conducted the classes during the course. Concluding ceremony was held at Ashram's lawn on May 30, 2008 and Dr. Ramesh Goyal, the Vice Chancellor of the MS University, Baroda distributed certificates to all the participants of the 15th YTTC. The 698th Yogasana, Pranayama, and Meditation Camp (May 12, 2008 - May 21, 2008) 927 yoga enthusiasts attended 698 th Yoga camp of Sri Swami Adhyatmanandaji from May 12, 2008 to May 21, 2008 at Sivananda Ashram, Ahmedabad. It was inaugurated by Dr. Bharat Trivedi, Dean of V. S. Medical College, Ahmedabad and Sri Surendrabhai Patel, MP. 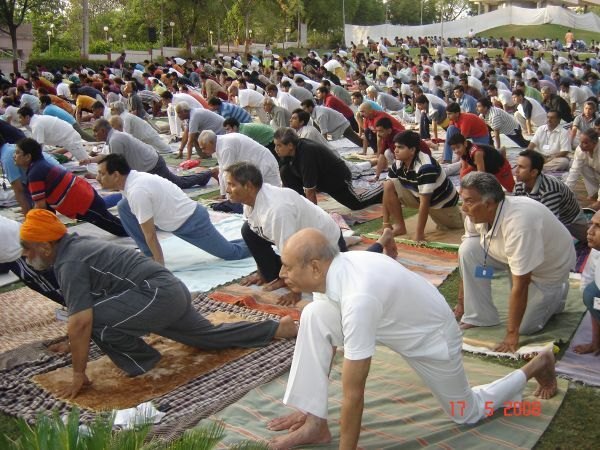 Sri Shakti Singh Gohel, opposition party leader of Gujarat Vidhan Sabha also attended the Yoga session. Tratak (candle light) meditation, pranayama, flexibility exercises, principal yoga postures, additional simple postures and relaxation techniques were taught everyday from 6.00am to 7.00am during the ten days of the Yoga Camp. 12th Anniversary of Sri Vishwanath Mandir. A grand Laghu Rudra Yajana was organized from early dawn to late evening. Eleven couples offered their respective offerings to the holy fire. Sri Vishwanath Mandir's evening Arati- Bhashma Arati was performed by Swami Adhyatmanandji Maharaj. Large number of devotees received Maha Prasad Bhandara after the evening Arati, which was followed by an evening full of Sri Nanduji's (Khatushyam fame) Bhakti Sangeet which filled the atmosphere with devotion. Grain distribution to needy and poor, food distribution to children living in underprivileged area of the town; Yoga and Reiki teachings and treatment and acupressure services were given to a number of patients this month also. Sri Satyanarayan Puja and Sri Lalita Sahasranam on full moon day, weekly prayer and Group Mrutunjaya Japa, weekly Paduka poojan, and daily Satsang are regular activities of the Ashram. 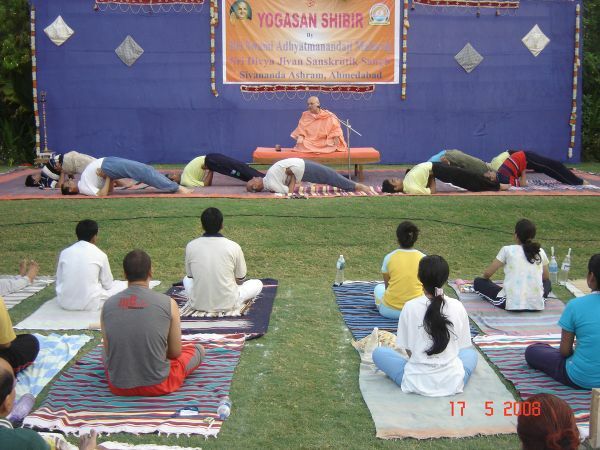 On May 31, 2008 morning , 11th Division of Indian Army invited Sri Swami Adhyatmanandji Maharaj to share on the subject of 'Stress Management', which was followed by Ten days Yoga sessions for the officials and their families. 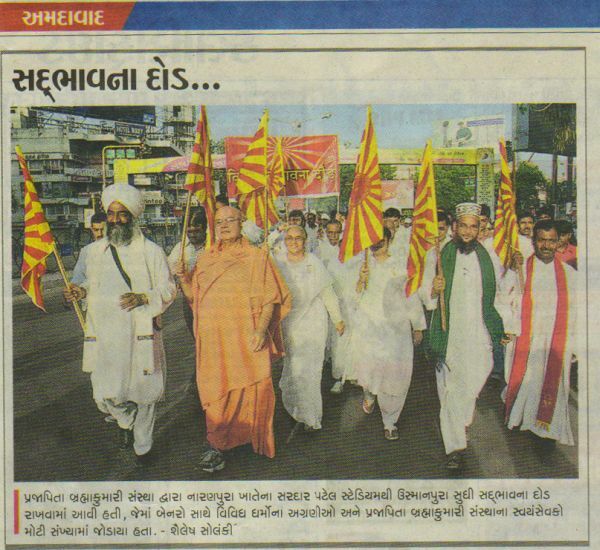 "Run for Harmony" (May 25, 2008) Brahmakumaris invited Sri Swami Adhyatmanandji Maharaj to lead the 'Run for Harmony'. Heads of Muslim League, Father from Holy Church, Gyani from Gurudwara and Dastur from Parsi Agiyari joined this memorable event..
On the May 9th, 11th, & 23rd nights Sri Swamiji Maharaj presided over Arangetral Bharat Natyam recitals presented by different schools of classical dance. Baroda Upon very sincere invitation of the Chairman of Oil and Natural Gas Commission, (ONGC) Vadodara, Sri Swami Adhyatmanandji Maharaj visited the facility. Sri Swamiji brought the spotlight on the subject 'I am the Solution for my Problems'. Plantation of trees was done by Rev. Swamiji Maharaj and Mrs & Mr. Executive Director of ONGC Baroda Chapter. Kadi "Be free from Ego, be Simple, be Noble, be Kind, be Courteous, be Good, do Good, Harmony will follow. Remember that we are not even a speck in the Cosmos." This is the message of H. H. Sri Swami Adhyatmanandji Maharaj at "Festival of Harmony " on May 25, 2008 at Sri Vivekananda Education Society, Kadi. Swamiji was cordially welcomed by Sri Jasbhai Saheb, Founder President of Sri Anupam Mission, Mogari. A special felicitation was awarded to Swamiji Maharaj. Haridwar Honoring the sincere request of H. H. Sri Swami Vivekanandji Maharaj of the famous Bhagavat Dham of Haridwar, Sri Swami Adhyatmanandji Maharaj graced the 50th Golden Jubilee celebration of Sri Bhagavat Dham. Sri Swamiji stayed here for two days on May 27th & May 28th. He was invited by many devotees at their home at BHEL, Hardwar. Rishikesh Sri Swami Adhyatmanandji Maharaj paid homage to the Holy Sri Samadhi Shrine, Sri Vishwanath Temple, Sri Gurudev's Kutir at the holy Sri Sivananda Ashram, Rishikesh. Sri Swamiji went to the holy darshan of senior Saints of Sivananda Ashram. Yamunanagar Sri Swami Adhyatmanandji Maharaj visited Yamunagar (Haryana) and graced the holy Havan performed by blessed family of Sri Surinder Vasudevaji, son Sri Pankaj and Smt. Amisha Vasudeva on the happy occasion of birth of their new born baby 'Pranav'. Delhi Sri Swamiji visited Delhi on His way to and from to Haridwar on May 26, 2008 and May 29, 2008. He had satsang with devotees of Sri Sadgurudev Swami Sivanandji Maharaj at Dwarka, Delhi. Surat "Each one of us are dwelling between life and death. Keep cheerful at all times in all conditions and in all situations. Rejoice in the struggle for perfection. You will abide in the Kingdom of The Absolute. Feel His divine Presence at all the time. Rejoice in the Self. Dive deep in the recesses of the heart and find the pearl of Peace Absolute". These were are the inspiring words spoken by Pujya Swamiji at the public meetings organized by Life Insurance Corporation of India (LIC) on May 31, 2008 at the famous Vithalwadi, Surat.